Q. How do I Track Assets? The Assets topic enables you to manage information about your home or business and the assets that you own. The goal of the Assets topic is to help you keep track of the things that you own or rent and the details about these items. This is important for insurance reasons in case of a loss or when maintaining the items for your home or business. For example, it’s a good idea to keep track of the details about your automobile, such as the purchase date, cost, current value, VIN #, manufacturer, photos, scanned insurance cards, and other details. If your automobile is ever stolen or lost, you’ll have all its information stored in one place. In addition, you can remind yourself when to service your vehicle, and you can also record any expenses and receipts related to the service. This applies to all the home and business assets that you track. Asset: All the items that you rent or own, such as vehicles, homes, boats, furniture, etc. Asset Services: The services (such as landscape maintenance, oil changes, repairs, etc.) that occur for your assets. Touchpoint to the Assets category of services in Contacts + Services. Touchpoints allow relevant information to be shared seamlessly between Assets and Contacts + Services. For example, you may have a landscaping service or a mechanic who performs regularly scheduled auto maintenance. You can define these service providers directly from within Assets as you are defining the home and car and they will show up automatically in Contacts + Services. Or, if you have already defined those service providers in Contacts + Services, you can link to them directly as you are defining your home and car in the Assets topic. Categories are available for use with assets. You can create, modify, hide, or delete categories via Settings for the asset. When an asset category is deleted, it is completely removed from your app. When an asset category is hidden, it no longer appears as a category for assets, but it remains defined in the app and is still available in the category list when you are defining a new asset. 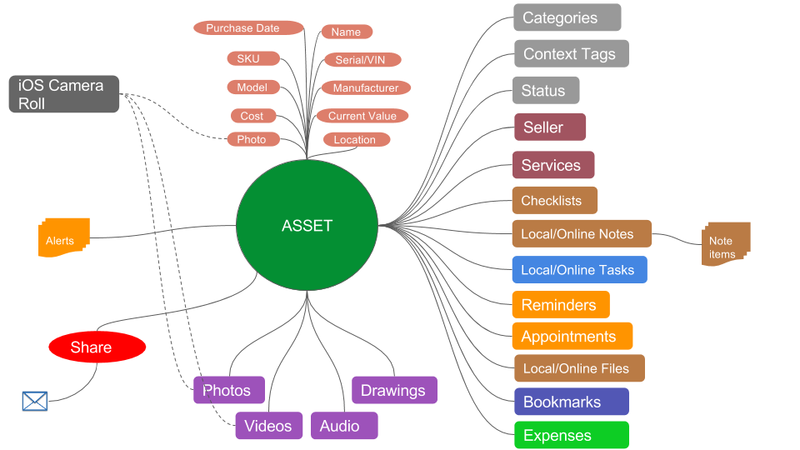 Note that asset categories that are in use or serve as touchpoints to another topic cannot be deleted or hidden. Any expense or service-related item that’s open and due in the future for five days appears in the Alerts section of the Assets view. For information about creating and modifying Assets, refer to Assets. For information about creating and modifying Services, refer to Services.